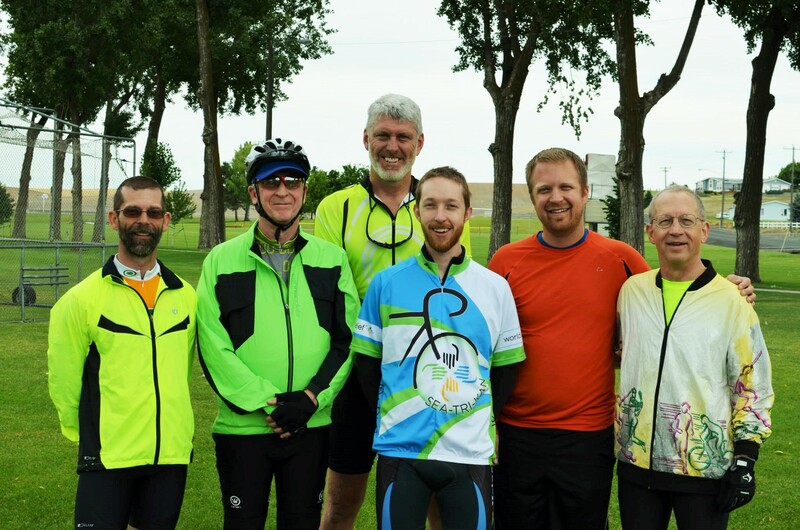 The following is a reflection from a participant in SEA-TRI-KAN, a cross-state bike tour that raised support for newly arrived families as they look for employment and begin a new life. NOTE: pardon the delay in posting the final day of blogging from the ride–the author took his sweet time catching up on sleep and restiing his sore legs! 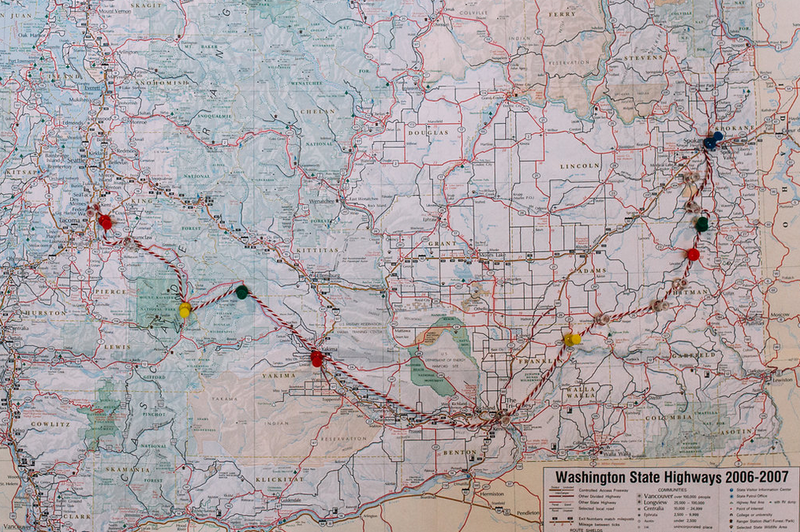 Ride total: Seattle to Tri-Cities to Spokane—over 400 miles & 12,000 feet elevation gain! The last day of SEA-TRI-KAN was Father’s Day. Naturally, I spent a lot of the day thinking about fathers—both my own dad and refugee fathers seeking a safer future for their children. For me, it was a particularly memorable Father’s Day for another reason: I am soon to be a dad myself! The STK dads (and one dad-to-be) pose on Father’s Day morning. The day before Father’s Day (June 20th), was World Refugee Day. One way we marked that day was to have each rider think about an individual refugee throughout the day as a way to reflect on the experience of refugees arriving to our community, and to stand in solidarity with them in one small, but hopefully meaningful way. Riding a bicycle all day long allows a lot of time for thinking. And thinking about one person, rather than trying to wrap one’s mind around the plight of 20 million refugees worldwide, was a way to remember and connect to the cause in a more accessible way. The person I thought about while riding 100+ miles on day 4 is a friend of mine from Bhutan who arrived to the Seattle area as a refugee in 2009. He is also a father of three. On World Refugee Day, I thought about some of the positive developments in his family (buying a home, getting a steady job) as well as some of the challenges (difficult work and childcare schedules, the busy-ness of life in America). It was good to reflect on and pray for my friend and his family. On Father’s Day/day 5 of the ride, I found myself continuing to think about my friend whose two oldest children were born in a refugee camp in Nepal. As I look forward to becoming a father myself, I can’t imagine being in his shoes. To watch your children shiver in the cold wind blowing through the cracks of a refugee camp hut built from bamboo and tarps, or to not have adequate medical facilities available for your sick child must be excruciating for a father. It is a wonder that so many refugee families survive such harrowing experiences. I have been blessed to meet and learn from the wisdom and courage of many fathers and mothers who have brought their families through such hardships. Luke and his dad, Gene, enjoying the little-traveled side roads south of Spokane. 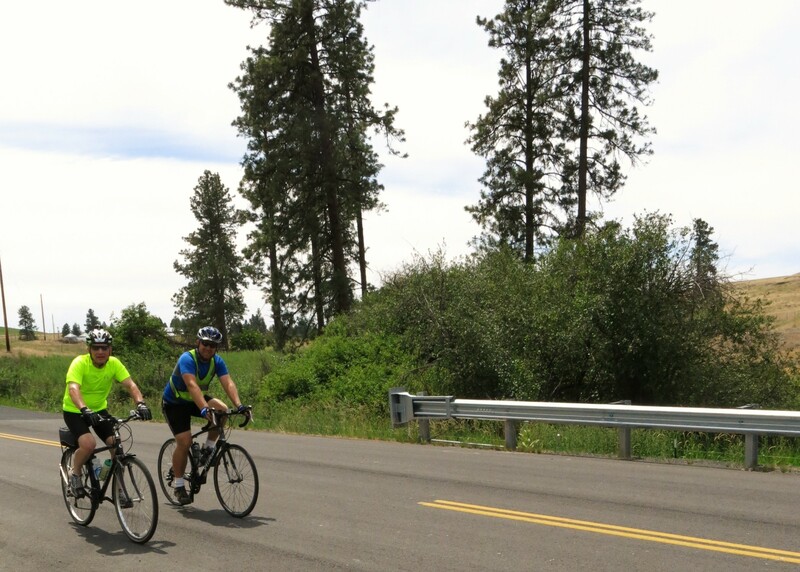 I was also thinking about my own dad on Father’s day because he was able to join us on the final day of the ride from Endicott to Spokane. It was a really fun day as we got to ride together through the beautiful rolling wheat fields and scattered pines and lakes of Eastern Washington. I realize that much of what led to my involvement with SEA-TRI-KAN in the first place is a legacy from my dad: love of travel and cultures was instilled at the dinner table and on family vacations; generosity was a value modeled by my parents as well. Thank you, Dad for coming along on the ride and for being the kind of dad who raises a son who thinks biking 400 miles to raise money and awareness for refugees is a fantastic way to spend 5 days. I hope I can pass along some of the same legacy to my children, and I hope to be in good enough shape at that point to ride alongside them, too! This entry was posted in SEA TRI KAN on July 3, 2015 by World Relief Seattle. Tri-Cities to Endicott: 100 miles to commemorate World Refugee Day. Secretly, I hate it when people ask us this. Outwardly, in the interest of seeming nice, I smile and nod and then try to change the subject. My wife Caitlin and I are riding Sea-Tri-Kan on a tandem bicycle. While it is true that some tandem teams can go noticeably faster than those riding solo, this is not true in our case. Our contraption is heavy, unwieldy, and cheaply made — a low-quality budget bike bought on sale from a big box store. Even after upgrading every component conceivable, it handles poorly, delivers bumps in the road to its riders with bone-jarring efficiency, and climbs like a broken-down freight train. 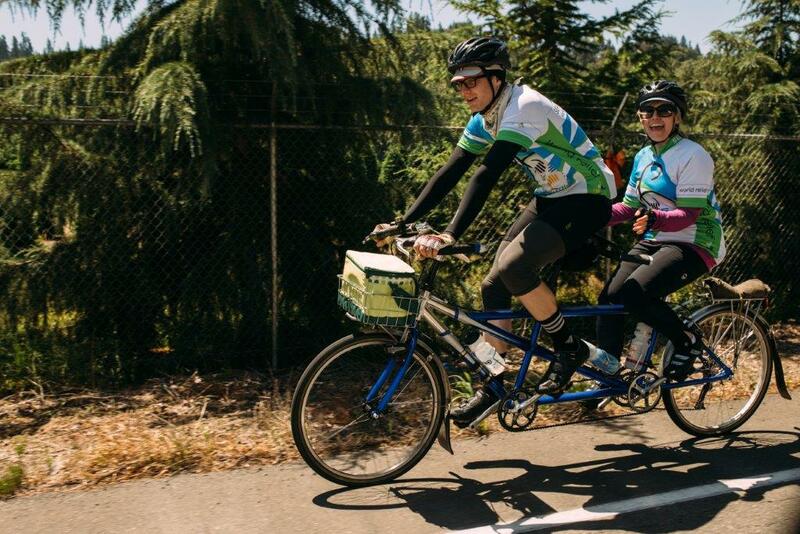 As my sister Shawna puts it, “it’s like an oil rig masquerading as bicycle.” Our tandem is much better suited for 4-mile trips to the grocery store – not 400-mile tours. It’s why we’ve recently given it a well-deserved nickname: the Struggle Bus. And then comes the answer. Today (June 20) is World Refugee Day – the day we commemorate those who are threatened because of their race, ethnicity, or beliefs, and must flee their home countries because it’s not safe to stay. My soreness and fatigue is nothing compared to what so many others have gone through. I can move freely around my state, and return to a safe home. I may get funny looks when walking into a convenience store in cycling stretchy-pants, but even if I look a little different, I’m not in danger here. In this light, riding the Struggle Bus with Caitlin and raising money to help refugees find jobs is a privilege, not a chore. I wear my soreness like a badge of honor, and I struggle happily, knowing that I am doing my own small part to help those whose struggles are much more real than my own. This entry was posted in SEA TRI KAN on June 23, 2015 by World Relief Seattle.